Andalusia: the cradle of the Andalusian horse, a land of deeply rooted traditions, the horses and the bulls, the pilgrimage to El Rocío, the sandy trails in the Doñana nature reserve, the beautiful pine forests and the marshlands, a winter paradise for the migratory birds. This is a new ride in the provinces of Sevilla and Huelva, a great destination for the winter months. In Andalusia it is still possible to ride through the most unimaginable landscapes for several days, combining nature with the most ancient traditions. Our attention to the detail is outstanding. We go as far as we can to anticipate all the little things that can make a difference. We have a lot of repeat guests that come back every year. We can give you direct references of riders from many different parts of the world. The selection of the accommodation and the service in every aspect of the ride is of outstanding quality. Lodging is very comfortable and full of charm. You will stay at traditional Andalusian country estates and cortijos (the Andalusian country houses). The Cortijo de La Corbera, www.lacorbera.es; where the ride starts and ends, has accommodation in the finca, eight beautiful bedrooms, charming and with all the facilities. 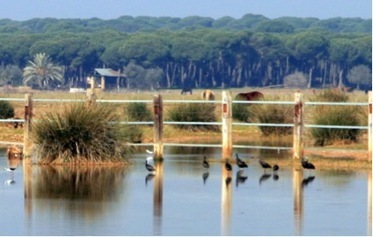 The Cortijo Ardea Purpurea (Purple Heron), www.ardeapurpureaturismo.com; in the boundaries of the Doñana nature reserve, has been built in the traditional country style, with thatched roofs and wood beams. In the magic village of El Rocio, we’ll stay at one of the traditional houses of this horse village, www.lincecasaruralrocio.com, . The whole village has sand streets and the houses have an inner courtyard and stables at the back. Breakfast, aperitifs, lunch and dinner are included while on the trek. The local cuisine is excellent and much consideration is taken when planning the meals to provide visitors with a sampling of the many different dishes produced in the area. Lunch is usually a picnic in the countryside with set tables, chairs... a small feast everyday¡ Some lunches will be cooked on the spot; others prepared by the village bars or restaurants, always exquisite. Dinner is at the hotels will feature a varied selection of the typical cuisine. All the drinks are included during the meals. Tasting of Spanish red & white wines; sherry; beer, juices, soft drinks and water. Meeting time around 16:30-17:00hrs. at the Sevilla airport or at the Santa Justa train station if you are in Sevilla already. 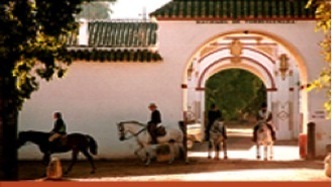 Transfer to the equestrian centre of La Corbera, south of Sevilla, near Utrera, about 20-30mins from Sevilla. It’s a beautifull Cortijo (traditional andalusian country state) that belongs to Alfonso Gonzalo de Bustos, our host and a great horseman with a background in Doma Vaquera and at present competin in TREC. 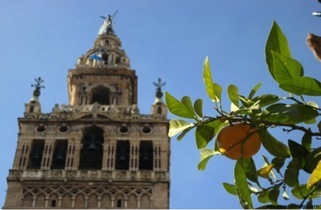 He’s passionate about horses and about Sevilla and it’s country and traditions. Welcome drink at the Cortijo and distribution of the rooms. The accommodation is at the finca with 8 charming bedrooms overlooking the fields and the horses. 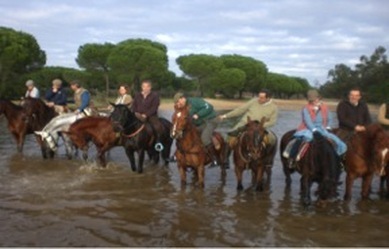 Distribution of the horses and short ride around the finca to try the horses. Dinner and night at La Corbera. 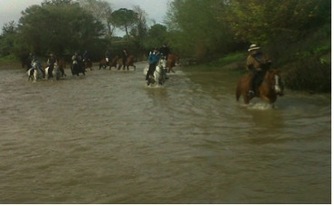 Horses will be transported to the Cortijo de Torrequemada, near Bormujos. 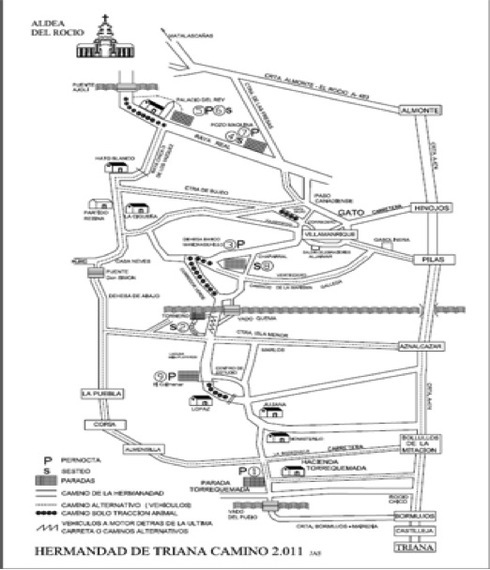 Riders will be driven to Torrequemada, about 30mins drive. Ride will start at Torrequemda, a XVI century Hacienda. Brief visit of Torrequemda. This is a traditional stop of the pilgrims on their way to El Rocio, the camino de Triana, from where we’ll start the ride. Through farming land of olive trees we’ll get to the pine forest for the aperitivo. We’ll follow the camino de Triana and stop for a picnic lunch before the river Quema. In the afternoon we’ll cross the river where the pilgrims traditionaly get baptized¡¡ Ride on to Villamanrique de la Condesa to the beautiful Cortijo Ardea Purpurea where we’ll spend the night. Morning ride through the pine forests, dehesas (holm and cork oaks estates) and private fincas. 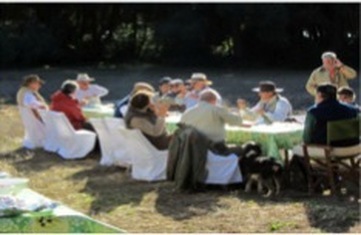 Aperitivo and picnic lunch in the countryside, near the Hacienda de Lopa. Through the beautiful pine forests we will reach the Camino de Aznalcázar and the Nature Reserve Dehesa de Abajo, a beautiful lagoon, rich in birdlife, common land where the local cattle grazes. Picnic lunch with views of the waters of the Dehesa. In the afternoon, we will ride around the reserve to get to the Hacienda de Gelo, end of the ride. The horses will get driven back to La Corbera.